Congratulations to the college Class of 2016. Not only are you mere days away from graduating (or maybe you already have), but you’re blessed with good fortune: This is the best time to enter the job market in close to a decade. Spare a thought for your older brothers and sisters, though. Many of them were far less lucky. A couple of weeks ago in this column, I discussed a report from the Economic Policy Institute, which argued that people finishing school this spring still face tough economic times. That’s certainly true for new high school graduates, whose unemployment rate remains well above prerecession levels. And it’s true up to a point for new college graduates, more of whom are being forced to settle for part-time or low-level jobs than before the recession. But overall, the situation greeting new college graduates looks comparatively rosy. The unemployment rate for recent graduates — those ages 21 to 24 — is down below 6 percent, close to where it was when the recession began.1 New graduates’ wages are rising faster than those of most other groups; the typical recent college graduate earned $13 an hour in the first three months of this year, up 50 cents an hour from a year earlier. The best evidence that the job market is improving for young graduates: More of them are choosing to participate in it. The share of young graduates in the labor force is rising after years of decline. The story is different for Americans just a few years older, those who graduated from college during the worst of the recession in 2008 and 2009. Their unemployment rate topped 9 percent in the aftermath of the recession, and the figure would have been higher if so many hadn’t avoided the job market entirely by staying in school or living with parents. Those who did find jobs were often stuck working part-time or in low-wage positions that didn’t require a college degree. Worse, the slow improvement of the labor market meant many young graduates remained underemployed for years; research from the Federal Reserve Bank of New York has found that the underemployment rate among recent graduates has only recently begun to improve. Graduates lucky enough to find stable work often missed out on the kind of early-career job transitions that ordinarily lead to both better wages and a better professional fit. That slow start left lasting scars. The typical recession-era graduate with a full-time job — one of the lucky few, in other words — earned approximately $7,000 less in the first six years of work than someone who graduated just a few years earlier.2 And that’s assuming full-time employment the whole time — many if not most graduates were jobless or working part time for at least a portion of that period, leaving them even further behind. The good news is the gap is closing. Americans who graduated in the recession earned as much in 2015 as their older peers did at an equivalent point in their careers (albeit in part because for the older group, those years were during the recession). They are now seeing their wages rise and their job prospects improve. But it’s too soon to know when they will fully recover from the damage done during the recession — if they ever do. A well-known study from Yale economist Lisa Kahn found that the financial consequences of graduating during bad economic times can linger for 15 years or more. More recent graduates, though, are off to a much better start. 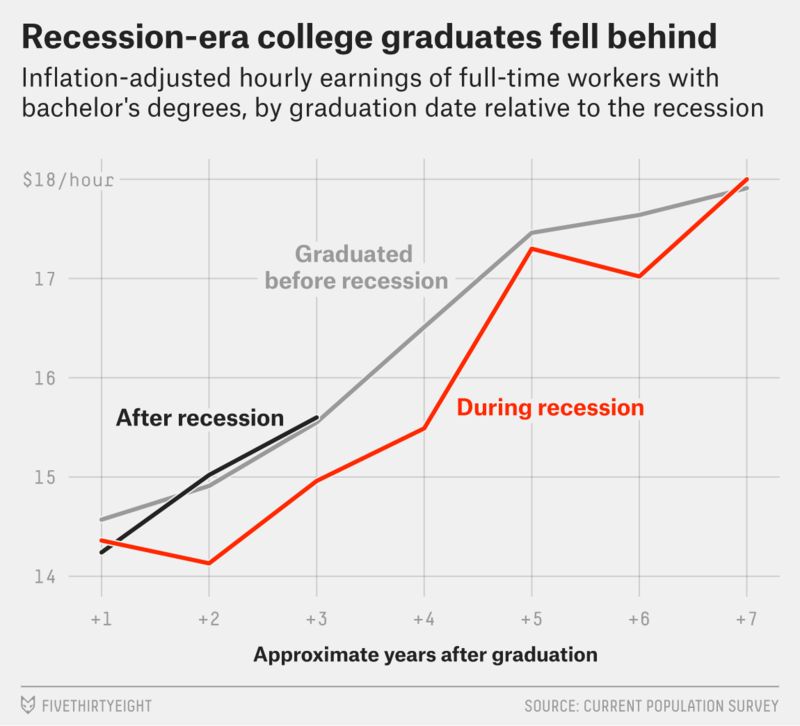 Those who graduated a few years after the recession ended are earning as much, adjusted for inflation, as those who graduated before the downturn began. Barring an unexpected crisis, the class of 2016 should do as well if not better. Their younger classmates should cross their fingers and hope the current economic expansion, already one of the longest since World War II, keeps going a while longer. As the Journal’s Josh Mitchell notes, the rising debt load isn’t all bad, given the improving job market. And even during worse economic times, student debt isn’t necessarily a bad thing. A separate analysis from the Brookings Institution this week showed that college graduates with debt still have a much higher homeownership rate than young people without college degrees. In other words, the debt — and the degrees they earned with it — is helping them get ahead, not holding them back. The trouble is that this bargain — borrow now for opportunity later — doesn’t work out for everyone. Some people take out more loans than they can realistically repay in the career they’re pursuing. Some attend colleges, often for-profit institutions, whose degrees turn out not to be worth much at all. And many don’t graduate, accumulating debt but no degree to show for it. About 3.6 million borrowers are in default on student loans, according to another article by Mitchell last month, and 3 million more are at least a month behind. That suggests that the system — high school guidance counselors, college financial aid offices, the Department of Education — isn’t doing enough to ensure that the financial decisions made by teenagers don’t come back to hurt them in adulthood. Millennials are packing up their downtown lofts and heading for the suburbs. A new study from University of Southern California demographer Dowell Myers finds that last year was probably “peak millennial” for U.S. cities. That is, after years of becoming more concentrated in downtown areas, young people are beginning to move in the opposite direction. Myers (like me) has long been skeptical of the notion that millennials prefer city living, instead attributing the urban shift to a convergence of various demographic and economic trends. But even people who think today’s young people really do prefer downtown life have always recognized that many of them would relocate to the suburbs once they got married and had children. With the oldest millennials now in their mid-30s, the lure of the lawn is proving powerful. Puerto Rico on Monday failed to make a nearly $400 million debt payment, pushing the island’s slow-motion financial crisis into a new — and highly uncertain — phase. The default is only a preview of what’s to come this spring and summer, when more than $2 billion in loans come due. Right now, the territorial government has no means to pay those bills. Puerto Rican leaders want to restructure the debts in a process similar to bankruptcy. But that would require congressional approval, which hasn’t been forthcoming. House Speaker Paul Ryan has been trying to negotiate a deal, but conservatives have labeled the proposed restructuring plan a “taxpayer-funded bailout,” which hasn’t helped its prospects. Meanwhile, the island’s economy is in shambles, with an unemployment rate near 12 percent. Neither the bailout plan nor any other proposal seems likely to fix that problem anytime soon. Home prices have rebounded faster in wealthier areas than in poorer ones since the recession ended. That’s contributing to increasing wealth inequality, Jim Tankersley and Ted Mellnik write. How can Japan get out of its decades-long rut? Narayana Kocherlakota, former president of the Federal Reserve Bank of Minneapolis, says the first step is to embrace inflation. Alana Semuels looks at efforts by cities to hold banks accountable for their role in the housing crisis, which saddled local governments with both direct and indirect costs. Why is productivity so weak? Neil Irwin offers three theories. According to Current Population Survey microdata, the unemployment rate for new college graduates over the past 12 months has averaged 5.7 percent, versus 5.4 percent in the 12 months leading up to March 2008. This is a rough estimate. The Current Population Survey doesn’t ask respondents the year they graduated, so instead I identified three cohorts of college graduates: those who were age 21 to 24 in 2005 (and therefore graduated before the recession began), those who were 21 to 24 in 2009 (meaning most of them graduated during the recession) and those who were in that age range in 2012 (and thus graduated after the recession and its immediate aftermath had ended). The CPS doesn’t track the same people from year to year, so in each subsequent year I identified respondents one year older in each cohort (ages 22 to 25 in 2006, for example). I then calculated the median hourly earnings of full-time workers in each group for each year available. The $7,000 figure is based on a 40-hour workweek and a 52-week year.